It’s turning out to be quite a month for megalithic tourism! I am blogging today from Corsica, that island in the Mediterranean to the north of Sardinia, with Italy to the east (to which Sardinia belongs) and France to the north, (to which Corsica belongs.) Both islands have indigenous languages older than Italian and French, and the road signs in both are bilingual. But the Sardinians speak several languages, and here in Corsica French is definitely uppermost. The islands were of course one large island, until the retreat of the last ice age and rise of sea level circa 8000 BC. It’s a nine-and-a-half hour drive from Manchester to Thurso, the little town on the very north coast of Scotland from where one takes the ferry to Orkney. Fortunately, after a busy week, I had with me trusted old friend and fellow traveller on various megalithic excursions (including the Isles of Scilly), Alan Slee, to share the driving. Leaving central Manchester at 7.30am, stopping for coffee once late morning and for lunch at the House of Bruar (an excellent and recommended stopover), we arrived in Thurso at about 6pm and stayed over at the Royal Hotel. It can’t be said that Thurso is a particularly thriving town, or that its 3* hotel was especially well appointed. The Station Hotel offered the better menu, and we supped there – the Cullen Skink being particularly good! The 8.45am ferry from Stromness Harbour to Scrabster on mainland Orkney rolled rather threateningly in high seas for the first 30 of the 90 minute journey, but was soon in more settled waters and landed us safely where we could at last drive out of the ro-ro and onto the island, and head for our cottage for the weekend. I have rented a good number of self-catering cottages in the UK, some old, some new, some large, some small, but I have to say this one was one of the very best, ever: warm, cosy, a superbly well kitted out kitchen, lovely bathrooms – all in all an excellent place: Unigar cottages – highly recommended. Exhausted from our epic journey of Thursday, we achieved little more than shopping on Friday, stopping off at Rennibister Earth House on the way – appropriately enough a neolithic store house – and scrumping for mussels and limpets on a beach of the Bay of Firth to soak in salt water overnight for a seafood soup the following day. 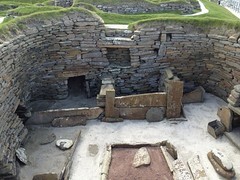 The truly ‘epic’ day, however, was Saturday, when we took in the Heart of the Neolithic Orkney World Heritage Site, comprising the Ring of Brodgar, the Stones of Stenness, Maeshowe Burial Chamber, and the neolithic village of Skara Brae. We rose early and went straight to the Ring of the Brodgar, arriving first before any other tourists, and were fortunate enough to have the site to ourselves. Once sporting 60 stones, this is quite simply one of the most impressive stone circles I have ever seen (and I’ve seen a few!) 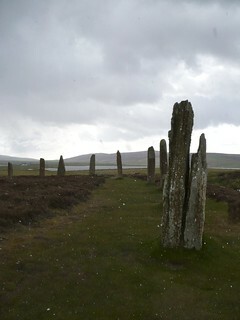 The central area is covered in heather and the signs clearly require visitors to keep to the path around the perimeter within the circle of stones. But the stones themselves are all so individual, so fascinating, that there is plenty to immerse oneself in without the desire to venture into the centre. The weathering of thousands of years is all too apparent on many of the stones, but the sense of mystery and awe seemed accentuated by the inclement weather that soon blew in from the Atlantic, bringing at one point a shower of hail to cloud up the lenses on our cameras. We completed the circuit just in time before the next tourists arrived at the circle, and as we left, gathered a few marsh marigolds to add to our lunchtime salad – a foraging delicacy plentiful in these parts. From the Ring it is but a few moments drive down the Ness of Brodgar, past the site of the excavations where a Neolithic Temple – some say a kind of Neolithic Hogwarts – is being unearthed. The archaeological site is only open for tours during digging, for six weeks each summer, so all we could glimpse was the black plastic sheeting covering proceedings. What may have transpired in this temple, further excavation may yet give tantalising hints at. Leaving it for another year, we continued across the Ness to the Watchstone, and on across the bridge (reputedly in place for thousands of years) to the Stones of Stenness. 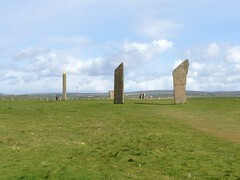 The Stones of Stenness is an amazing circle. Once twelve stones – (one has to wonder whether there might be some sexagesimal significance to the 60 stones of the Ring of the Brodgar and the 12 of the later Stones of Stenness?) – there is an aura of majesty around the tall and imposing stones that the Ring, with its smaller and more weathered stones, somehow lacked. The Stones of Stenness feels more like a grand chapel for the mighty, compared to the cathedral-for-all at the Ring of Brodgar. Behind it, at the Barnhouse ‘village’ site, one feels rather in the lodgings of a priesthood that ministered at Stenness, like the cells of an abbey, and one can almost envisage grand ceremonies undertaken by the elect at Stenness for vast geo-political strategems, by the monkish inhabitants of Barnhouse, alongside more prosaic public ceremonials for the masses undertaken at the Ring of Brodgar. In between, secret preparations and initiations in the Temple of the Ness prepared the priesthood for their labours. Such imaginings are perhaps merely fanciful, yet in truth even the interpretations of the most knowledgeable of archaeologists are often little better. I rely a great deal upon the careful work of archaeologists but confess I rarely take their ideas of what life and ritual were like thousands of years ago without a good helping of salt. It is only a decade or so since even the idea of archaeo-astronomy – the alignment of Neolithic sites with solar and lunar risings and settings at various times of the year – became anything less than New Age rubbish as far as professional archaeologists were concerned. It is now broadly accepted orthodoxy across Europe. Stellar alignments of course remain very hard to gauge, as the night sky moves inexorably with the precession of the equinoxes, and what may have been true in 1500BC is yards off today. But – complex though their movements are – the sun and moon rise and set today pretty much exactly where they did 5000 years ago – give or take a few inches – and at Maeshowe, in particular, the Winter Solstice still lights up the inside of the chamber with startling accuracy. 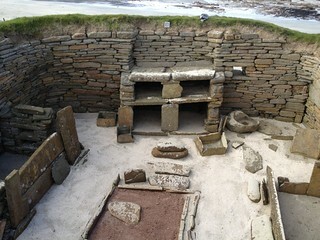 This chamber, built with four standing stones at its corners, and three more, shorter, stubby ones each immediately below the openings in the sides of the chamber allowing access to sub chambers, and all completed with the most amazing and enduring masonry in between, is quite literally the most accomplished feat of Neolithic masonry I have ever seen. Certainly more accomplished than Newgrange, for all the marvels of its corbelled roof, which I visited in 1996. Certainly more accomplished than the temples of Malta, where I visited in 2008, for all their gigantic size. Certainly squarer and more precise than the chambered tombs of Jersey (Apr 2009) and of the Isles of Scilly (Aug 2009). I was really quite stunned. This was masonry on a par with the Egyptians (March 2007): and they were later. And there is no evidence of any burial in this chambered cairn – only some tale of human and horse bones that were mysteriously ‘lost’ by the Victorian antiquarian who ‘found’ them in the cairn. The mystery of what this place was really for, remains. Finally then, to cap an already amazing day, to the village where the people who worshipped at these great temples actually lived: Skara Brae. The wonder of this place is not so much in the finery of its furnishings, the layout of its dwellings…. all these seem, somehow, so natural, so thoroughly familiar. The wonder is that they have been dated to 3100BC. That’s contemporary with the temples on Malta – complete with strikingly similar stone dressers! The wonder is that they have survived at all. The reason? On Orkney, already by the time of the Neolithic people who began farming here in the late 4th millenium BCE, there were no trees here. Mesolithic man had long ago cut them all down. So the village – like the temples – was made out of stone. 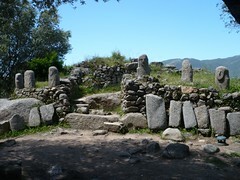 Yesterday, in Corsica, at Filitosa, [see the pics on Flickr here Corsica pics on Flickr] I discovered another of these extraordinary archaeological/environmental cross-overs. Remember the Bronze Age warriors of the 2nd millenium BCE whose little metal statuettes are so common on Sardinia (Apr 2011), the island to the south where the Nuraghe were built? Well it seems that here on Corsica, where not only the absence of any obsidian meant it had to have been imported from the southern island, (from where most of Europe’s Neolithic obsidian haled) but also the lack of any metal ores, meant that the statuary of Corsica had to be in done not in bronze, like their southern cousins did, but in stone. 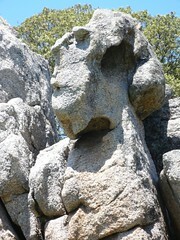 So here, in Corsica, almost unique in all of Europe, one can witness the phenomenon of the statue-menhir – megalithic menhirs that, in the Bronze Age, were carved in the likeness of fierce warriors, brandishing swords and daggers – the latter undoubtedly imported from the neighbouring island to the south. The weekend in Orkney ended on the Sunday, with a visit to the southernmost island of the Orkney archipelago (all one great island in Neolithic times, as were the Isles of Scilly, and islands of Corsica and Sardinia), South Ronaldsay, accessible over a series of causeways that link it, via a couple of small islets, to the mainland of Orkney, and, on its southernmost coast, the Tomb of the Eagles – a chambered cairn entered through a very low passage on a large skateboard. The roof was completely new, concrete, yet the aura of the place didn’t suffer too much from this reconstruction, and the skulls in one of the chambers set the place off as a truly eerie burial chamber, quite unlike the experience at Maeshowe. It must be said, however, that the private management of this site was not a patch on the professionalism of Historic Scotland at the World Heritage Site. Monday, all day, I drove, and drove, and drove…. 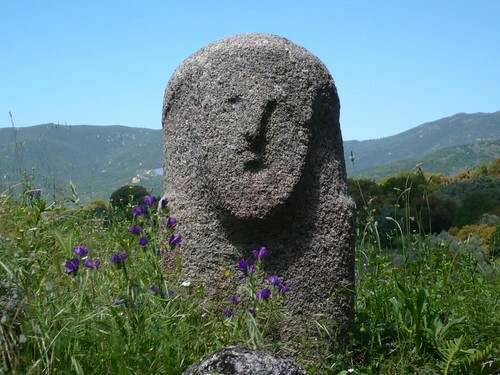 Then on the following Sunday, an aeroplane, landing at Ajaccio, and a hire car down to a little gite near Sartene – not a patch on Unigar but sufficient for my needs, and Monday, the crown-jewel of Corsica’s prehistoric monuments, Filitosa – an extraordinary experience indeed. Filitosa is a large and fascinating complex. There is evidence of several thousand years of occupation here, from the Mesolithic, through the Neolithic and Megalithic, and on into the Bronze Age. 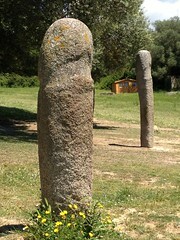 The rough-hewn menhirs familiar to the rest of Europe, and contemporary with the megalithic era in Malta (Mar 2008), and Portugal (July 2007), are in evidence, but much more striking are the later, Bronze Age statue-menhirs, carved menhirs that resemble both huge stone phalli and statues of warriors. To my eye both are implied by the artists who created these amazing works of prehistoric art, between three and four thousand years ago. The warriors they represent, resplendent in their armour, with their daggers and swords, wear helmets every bit as phallic as they look, and the statues are monuments to the virility of the warriors and to the fertility of their power. There is only oblique mention of the phallic symbology in the guidebook, in this Catholic country, but reference is inescapable. The interpretive work undertaken by the landowner and the Corsican authorities has resulted in some slightly deceptive placements. The six small statue-menhirs on the central monument are the broken upper-halves of once taller statues-menhirs that were incorporated into the spherical dome-like structure built over the top of the end of the spur by Nuraghic-era people occupying the site later than the creators of the statue-menhirs. The Western monument, below the Central Monument, is very Nuraghic indeed, bringing my trip last year to Sardinia strongly to mind. The grouping of the five tall statue-menhirs by the tree below the spur is clearly recent rather than historic. In truth what is visible now is (necessarily) a melange of several different periods of occupation overlain with late-20th century interpretation and reconstruction. By far the worst part of this muddle, however, is the placement of small plastic installations emitting quite horrid ‘mood-music’ here and there around the bluff, in between narrative descriptions. These, along with the regular, taller, metallic ‘interpretation stations’ with buttons for different languages – which unfortunately do not offer an ‘off’ button – turn this central area of the site into a kind of outdoor museum, neither one nor the other, and the French commentary interspersed with the ‘mood-music’ is the permanent default. This I must say I found most off-putting, and it was only at the platform, under the tree above the group of five tall statue-menhirs, that, hands on the stone, with only the whisper of the gentle breeze in my ears, I could in any sense ‘feel’ any of the majesty of the place. Climbing further up to what they have termed the Quarry, to my eye the most striking sight was the clear face within the rock – far more interesting than the so called ‘dinosaur’ to the rear of the rock formation. Here, indeed, it seemed the Goddess of Stone and Earth looked out across the entire site, with her eerie headdress and staring eye. The Bronze Age hut foundations, perhaps the dwellings of the carvers of the statue-menhirs, were fenced off, and hard to see – quite a contrast with the Barnhouse or Skara Brae – and clearly insufficiently ‘mysterious’ for the curators of this tourist attraction. I have to say, in the end, that the overlay of interpretation at this site to a certain extent spoiled the experience, certainly when viewed in contrast to sites elsewhere where the interpretation is strictly separate from the site, and relatively unobtrusive, though the reconstructions undertaken by archaeologists are everywhere evident: even the Stones of Stenness had been re-erected from recumbency within the last hundred years. Nonetheless, the site is well worth the visit, if only to see, and feel the majesty of the extraordinary art-work of the Bronze Age statuary.